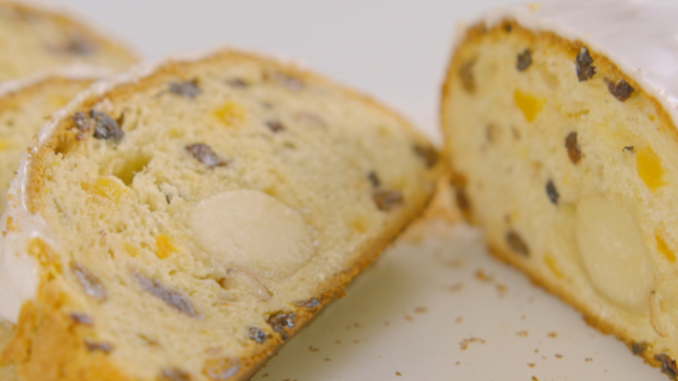 At Christmas time in Austria, Germany and parts of France they traditionally serve something called stollen: it is a rich fruity yeast bread filled with almond icing (marzipan) and topped with a light glace icing. First put 300g of the flour, together with the salt and yeast, into a mixing bowl and give it a quick mix. Sprinkle in the currants, candied peel, sultanas, apricots, glace cherries, chopped almonds, lemon zest and caster sugar and give it all a stir before making a well in the centre. Then add the butter and pour over the hand-hot milk. Add the beaten egg and mix everything together with a spatula– until the mixture is well blended. Now sprinkle 25g flour on to a board (you’ll need this because the mixture is very sticky), and pile the mixture on top. Then turn the dough over in the flour and knead lightly to form a ball. Now return the dough to its bowl and place it in a polythene bag closed with a clip and leave it at room temperature until it has doubled in size (the time this takes can vary depending on the temperature – it could take up to 2 hours). After that, turn the risen dough out on to a board floured with the remaining 25g of flour. Punch the air out of it and knead it back into a smooth ball and then shape the dough out to an oblong about 15 x 20 cm with a floured rolling pin. Using your hands, roll out the marzipan to form a sausage shape about 14cm long and place width ways in the centre of the dough, finishing just short of the edges. Simply bring one side over the marzipan, followed by the other. Then carefully turn it over, so that the seam is underneath, and place it diagonally on the baking sheet, allowing plenty of room for expansion. Put the whole thing in one, or you may need two, lightly oiled polythene bags and leave it to prove in a warm place until it has doubled in size again. (This will take about an hour). Remove the bag and bake for 40 minutes in the centre of the oven. Allow it to cool on the baking sheet for about 5 minutes before lifting it on to a wire rack. Meanwhile make the glaze by mixing the sifted icing sugar with the lemon juice, then use a palette knife to spread this all over the top surface of the stollen, whilst it is still warm. It’s best eaten as fresh as possible, cut into thick slices, with or without butter but the next day it’s very good lightly toasted. Note: If you want to make it in advance it can be frozen on the day of baking as soon as it has cooled (without icing it) then defrosted, warmed and iced on the day you want to serve it. Also it can be cut and frozen in two halves and if you’re not keen on marzipan this recipe can be made without it.